The intro for Sean Hayes’s episode of WDYTYA interestingly skipped over the TV show he starred in recently, “Sean Saves the World”, which I watched. Oh well. He didn’t know anything about his father, having left when Sean was five years old. He knew that his father was an orphan, so did his father know his own family history? If Sean was so interested in his father’s history, why not try to reach out to him? His brother mailed some information about what he knew, which wasn’t very much, and some photos that he got from his father. Did he get those more recently or back when he was a kid? And suddenly they went to Ancestry, seemingly at random. Conveniently, the 1940 Census came up as the first result. The search engine is weighted to show those results first. Was someone off camera telling him to look at more? Look at the image, look at the columns on the right, these are the kinds of things that new genealogists don’t know to look at. With the 1940 Census listing in Chicago, Sean went there. At the Chicago History Museum, he met historian Mark Largent. The first document, which I was hoping for, was the death certificate for his grandfather. With those indexed by Cook County, unless he died elsewhere, it should have been easy to find. Sean read the age and calculated when he died, but it said so right on the certificate. “If I go back to my makeshift little timeline…” Sean was keeping notes. And they were awesome. 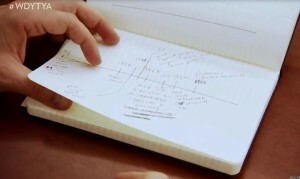 Check out the timeline drawing in Sean’s notes. Sean asked about the address where is grandfather lived, and the hospital in which he died. And the historian knew all the answers. How do you find out what kind of neighborhood an address was in? I mark the address, sometimes check it on a map, but I’ve never tried to understand the neighborhood. Sean was also very interested in the fact that his father left the family about the same time his grandfather left the family. Did he ask questions about why he left? Maybe they didn’t know that. I wonder if they had to guide him to some of the questions that they were prepared to answer. It seemed that way to me. Not that there’s anything wrong with coaching the celebrity to ask the right questions. At the Circuit Court, historian Dr Margaret Garb recommended checking Ancestry to continue to an earlier census. To me, that was obvious. In fact, I would have done that first, but the show doesn’t go in order of how someone does the research. The census verified that his great-grandfather was the immigrant of the family, though he had already said that. Was he assuming that or is something out of order or skipped over in the episode? Sean kept reading and saw that naturalization said “no”. Margaret corrected him that Patrick was naturalized and conveniently the papers were right in the building. That’s actually a good point about teaching what the records mean. Someone who doesn’t know what they are supposed to say wouldn’t know. Sean looked through the microfilm of the index cards, and boy did they look bad. “So the date might not be quite right. The census is often not accurate.” Another good lesson on comparing immigration dates on the census to the actual immigration dates. And then he found the papers in the original book. I have seen those on microfilm so many times. I hope he checked the other pages after reading the Declaration. What about the Petition? Were any of the kids listed on it? Was there a Certificate of Arrival verifying the ship information? Don’t pretend to teach a little about genealogy research and then skip the important stuff. Teach people to look at everything, turn the page, make sure you’re not missing some bit of genealogy gold on the back side. The Declaration that Sean read was from 1918, so he had plenty of time to get married and start a family after his 1901 arrival. Sent to Ireland to learn more about Patrick, he met historian Dr Shane Kilcommins at the National Archives of Ireland. The 1901 Census was waiting for him, with Patrick living in a prison. The census oddly listed only initials. I’ve seen US censuses with full names, but I guess that’s the way it is there. I haven’t done much Irish research. The next book required gloves, and was placed on a pillow. (I loved the pillow. I think we’ve seen that before in another episode.) An earlier book showed another incarceration, with another Hayes. I like that Sean noticed that. I remember other episodes where they didn’t acknowledge anything else on the page, and sometimes there were records for the same surnames. “I’m going to be standing in the exact spot that my great-grandfather stood when he got sentenced. It’s a very proud moment!” I love Sean’s enthusiasm. Shane was there to guide him at the Tarbert court house as well. “It’s a weird thing to get excited about.” No Sean, it’s not. It doesn’t matter what your ancestors did, you can be excited just to learn about it. In more records, Sean learned that the two men were brothers who assaulted their own father. A list of infractions for Patrick Sr was very long. A ten year gap of law-abiding suggested to me he may have spent some time in prison, but no one came up with that on the show. The next record showed that his wife died at the point the infractions began again. But what happened during those ten years? Was he really a good family man during that time as Sean said? That’s where they leave it off in the episode. At the end of the records, Sean headed to Ballylongford to see where the family came from. I loved Sean’s enthusiasm about standing where his ancestors stood when they were in court for assault charges. He showed a great interest in his family. There were a few conclusions made without evidence shown in the episode. In one such case, Sean mentioned the brothers, then corrected himself saying they hadn’t proved they were brothers, which was a good catch. Seeing Sean’s notes was fantastic, and that he wrote it out in a timeline. Showing him looking through the microfilm index to find the records was good, WDYTYA trying to sneak in a little genealogy teaching, but not showing the records that search led to left me a little empty. They never did look for his ship list or information about his family in the US. When did he marry Jennie and have the kids? The Irish research suggested that happened in the US, but it was never mentioned. Since the Declaration was so long after his arrival, it was likely. I really would like to see the teaching side improve even more, though I’m glad they now include it. There’s still the matter of how many hours it takes to really find all of the information they present, leaving some watchers probably thinking it’s easier than it is. (But that’s Ancestry’s thing: type in your name and your whole tree magically appears. Right?) And I wonder if they’ll ever mention that you don’t have to travel all over the world to find the records of your ancestors. Although, the travelling part is fun. The URL of this post is: http://idogenealogy.com/2015/04/12/wdytya-6×04/.